Once I surrendered to the possibility that I would not see Mytre again, I actually opened a Parallel Reality in which I could be with him. This option occurred because I thought of his needs, rather than just my own. In this manner, I extended my love to him unconditionally. In other words, I chose unconditional love over my own selfish needs, which greatly expanded my consciousness. In the same manner, when Mytre had his Initiation of bi-locating to our wilderness home to assist me, he extended me unconditional love by endangered himself by staying so long. In fact, we were having our Initiations together. His challenge was bilocation, and my challenge was to enter the Sacred Rock with my physical form. The first time I entered the Portal of the Sacred Rock, I had done so in my fourth dimensional astral body. Before I speak of my third Initiation within the Core of the Great Mother’s Womb, I would like to define and share the purpose of an “initiation.” An initiation is whenever we accept whatever what may be perceived as a difficult situation and turn it into an opportunity to ask our higher expressions of our SELF for guidance and protection. By calling in our Higher Dimensional SELF, we use the “problem” as an opportunity to perceive our reality from a higher perspective. From the perspective of our Higher Expressions of SELF, we can perceive expanded frequencies of reality. Since, the reality we choose to perceive is the reality we choose to live, calling upon our higher perspective of a difficult situation greatly expands our consciousness. In this manner, we transmute a problem into an Initiation. With my third journey through the Portal of the Sacred Rock, my Initiation was within the womb of the Mother. Once, I had reconstructed my wilderness home and return to the rhythm of Nature and the Core of my SELF. I was ready to enter the Core of the Mother. In preparation, I fasted for several days, drank lots of water, and meditated for most of the day. In between my meditations, I walked the land and swam in the Lake to ground myself and reconnect with the Mother. On the third day, I awoke at dawn and knew it was the NOW for entering the Mother’s Womb. This day I ate a light breakfast, as I did not know how long I would be away from my home. Then, I walked to the Lake, reverently placing each footfall on the surface of the Mother’s planetary body and meditated on a large rock overhanging the Lake. When I completed my meditation just before High Sun, I dove into the Lake naked and allowed the Mother’s Water to caress my physical form. I then crawled back onto the rock to bask in the warm sunlight and fell into a dreamless sleep. I awoke just before Sunset, put on my handmade garment and walked to the Sacred Rock. With my third entry through the Portal, I was free of all apprehension. Hence, there was no resistance within me or within the Portal. In fact, once I touched the rock with my intention of entering, the Portal instantly spun open, and I merely walked through. I heard the Portal close behind me, and I was in total darkness. However, as I relaxed into the NOW, I felt my own inner light and projected it out through my Third Eye. Through my higher vision I could see a small trail leading downward, which I followed for what appeared to be a very long time. Then, in the far distance and around a corner I say the reflection of a light. I instinctively knew that the light was beaming from the Elohim Alycone. Therefore, I took a long moment to call upon my highest expression of SELF and reverently walked into the light. Instantly, Elohim Alycone shown before me, and I felt a sense of deep completion. I had completed one important segment of my life and was about to begin another. I did not know how my new life would proceed, but I felt confident that I could accept whatever my destiny put before me. What I did not expect was how difficult it would be for my body and psyche to live in the core of the planet. The light was very dim with no obvious source. Instead, it reflected off the many walls of the cave-like structure in which I stayed for an unknown period of time. Since there was not Sunrise, Sunset, daytime or nighttime, there were NO markers for the passage of time. I had not realized how the passage of time had become so important to me. I had experienced being in the NOW when I was in Nature, but I had the security of the visual movement of the Suns moved across the sky, and the Moons and Stars came out at night. With no Suns and no Moons I felt almost lonely. It seemed that all I was doing was waiting. After my first image of the Mother, She disappeared and left me seemingly alone. Therefore, I was forced to FEEL the planet and connect with this huge planetary life form from the inside. I had learned to deeply know and love the outside of the planet. Now I was left alone to unite with the inside of the planet. I knew I was in an Initiation because every dark thought and fearful emotion was forced to the surface of my consciousness by the dim light of this unknown world. How could the Mother abandon me? Will I wither away and die down in this hole? Will I ever see my loved ones again? I went from questions, to anger, to sorrow and into deep fear. Finally, I could take no more and passed out, or maybe I just fell asleep. This time my sleep was filled with dreams, actually nightmares, in which everyone I had ever harmed taunted me about my mistake of entering my own early grave. Then the demons came in their dark, misty costumes of fear and sorrow. I was on the edge of total terror when I hear the voice of my beloved daughter Alycia. Yes, yes, of course, I could feel Alycia’s love. Then, I could feel her touch and her hug and her gentle kiss upon my cheek. I calmed down and the visions of darkness recoiled in horror by the vision of our deep love. 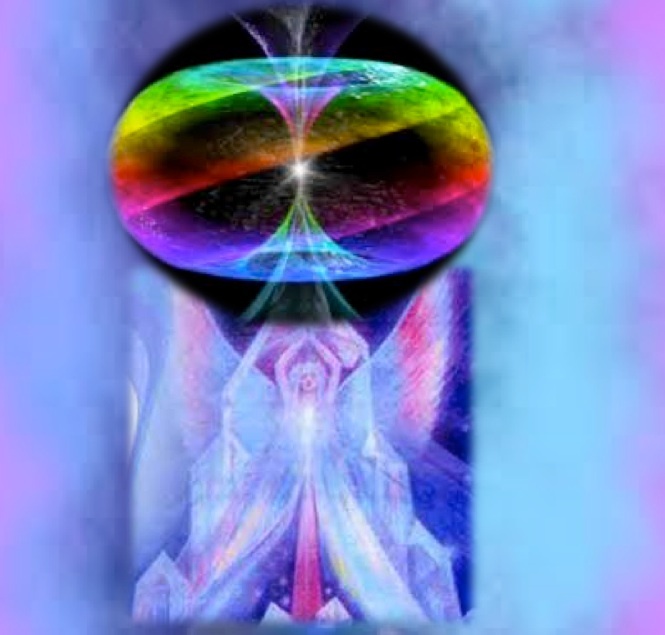 My eyes calmly opened, and I stared up into the face of the Elohim Alycone. Mother Alycone, as I would call Her, reached out with a very tangible hand and helped me to my feet. This sounded quite exciting to me, so I surrendered into Her aura and prepared for an interesting journey. However, there was no “journey” at all. Before I could blink my eyes, we arrived at what appeared to be an entrance to a cave within a cave. This entrance was very high and just wide enough that I could slip through it, I hoped, because the Mother instructed me to enter the inner cave through this very narrow passage. The entrance was quite long and very dark. Hence, I focused on going through the long corridor rather than where I was going. Therefore, when I rounded the final bend and was greeted with a bright light, I was almost blinded. I had to take a long breath to calm myself and slowly open my eyes in order to gradually acclimate to the change in illumination. Slowly, I opened my eyes while primarily directing my gaze on the ground beneath me. “Look up, my dear,” I heard Mother Alycone saying. Feeling confident that my eyes were adapted to the bright light I looked up to see the most amazing vision of my life. Before me were gigantic crystals as large as buildings cast about the cave as if they were the abandoned toys of a huge Giant. “That is almost correct,” said the Mother responding to my thoughts. “These crystals were once aligned into a massive matrix of light. However, the many cataclysms that accompany the development of a new planet scattered the matrix of crystals into what you see now. However, although the crystals appear disconnected, the energy patterns of each huge crystal are still interconnected with the energy of the other crystals. I closed my eyes to go into a state of meditation deep enough to open my Third Eye. Slowly, as my Third Eye opened, I began to see the interconnections between the emanations of each crystal. I realized that I recognized this pattern, but could not remember from where. “Have you not seen this pattern many times when you meditated on my land?” asked the Mother. Yes, of course. That is why the pattern was so familiar. I had seen it in the sky, in the water and on the land. Often, I only perceived it through the corner of my eye, but then the pattern would quickly fade. Therefore, I thought that I was creating that pattern rather than seeing it. “Look now to see yourself within that pattern,” instructed the Mother. I had not thought of myself being in the pattern, but the concept warmed my heart and made me realize how much I had become ONE with our new world. I closed my physical eyes and relaxed into deep breathing. Gradually, I felt my body tingling as the flowing of light coursed up and down my spine. When the energy throbbing out from the palms of my hands I knew that I was ready. With my eyes closed, I focused my inner vision to see the pattern of light that had become so familiar. As I surrendered to my vision, the recognizable light pattern began to float around me. I looked to see where my consciousness intersected this the light pattern. As I relaxed into the image, I could tell that I was within this pattern and the vision was within me. At the same time, I was fully aware that everyone shared this relationship with the pattern, even if they did not know it. As the Mother spoke, I began to fully experience a deep unity with the Planet. I have lived in Unity with the land of the planet, and now I was experiencing a deep connection with the planetary core. In fact, the connection was between my personal core and the planetary core. I stared into the formation of the crystals lying randomly on the floor of this inner cave. However, as I stared into the energetic connection of the crystals, the crystalline formation no longer appeared unintentional. I looked up to the ceiling of the cave, which I had not thought to do before, and saw the ever-present pattern reflected on the ceiling above the crystals. I pulled the vision of this pattern into my heart, and when I did so, something very unusual began to occur. Violet light began to bleed into my inner vision. At first the color violet was focused only in my heart, but it quickly grew to encompass my entire body. I actually “felt” the color violet. I had never thought about kinesthetically feeling a color, but that is the only way I can explain my sensation. As I became accustomed to the “feeling” of the color, the violet light began to flow, move and pulse. At first the pulsing was very gentle, but then it began to throb within me to the point that it almost hurt. The hurt became a pain, not unlike a labor pain, when, suddenly, the sensation of color burst into the image of a small inner flame. When I focused my attention into the violet colored flame, it grew larger. The violet flame seemed to be making me feel rejuvenated and activated. However, gradually, this sensation became quite uncomfortable and gave me the sensation that something inside me was beginning to morph and change. This impression increasingly became stronger and more uncomfortable. Finally, I could not hold this image any longer, and my eyes reflectively flew open. To my great surprise, I saw the violet flame as it steadily emerged from within the center of the fallen crystals. As the flame grew stronger and larger it’s image was replicated within each enormous crystal. 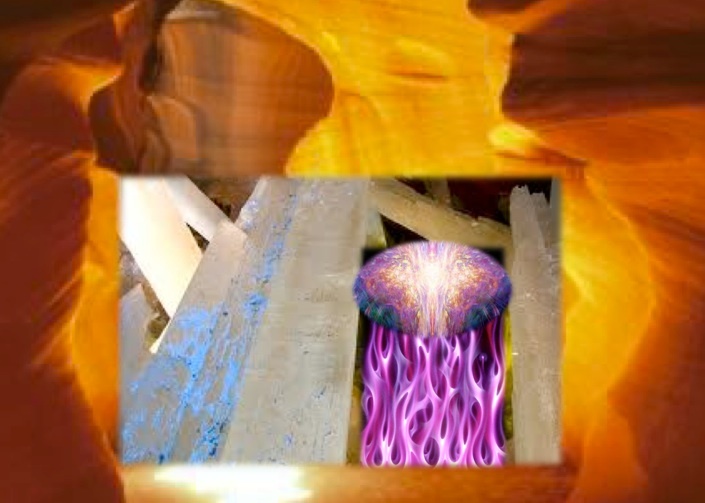 Then, each crystal projected the image of the violet flame out into cave. 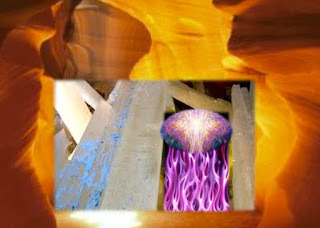 I watched in wonder as the many images of violet flames bounced off the many angles within the cave. In addition, the combined energy patterns of the crystals cast myriad images of violet fire onto the surfaces of the cave including the floor and the ceiling. The images were beautiful beyond imagination and deeply intoxicating. To my surprise I could see different expressions of my Multidimensional SELF within every crystal and every reflection. I was able to simultaneously connect and directly experience every version of my SELF. I could feel myself being pulled into the many impressions of violet fire as it flickered within every crystal and on every surface of the cave. The many versions of my SELF began to connect, which created an overwhelming feeling of bliss and euphoria. As I began to feel as thought I was every ONE of my expressions, and I lost all connection to the “separate” body standing next to the Mother. I was every expression of my SELF. Thankfully, the Mother moved her hand across my face and all the images disappeared. “Did I imagine that?” I asked the Mother. I think that's great that you're taking the time to do this translation. There's a huge amount of information on Suzanne Lie's other site, multidimensions.com where she was writing under the pen name Suzanne Carroll. I have no idea if this is available currently in Japanese. While the crystals in this Mexican cave aren't as big as described, these photos may be useful in visualizing them.